T he team at Praxair sponsored a corporate charity build for 16 good kids in New Hampshire. Scott Fogg, the Safety Manager, put on an impressively organized event. The focus of the charity bike build event was Praxair’s 6 Safety Principles, Team Building, and Community Engagement. After a morning of safety training and team building exercises, the team set up outside to build the bikes for local children. Each team had the bikes, tools, and helmets for a special kid. Teams also made welcome cards personalized for each child. 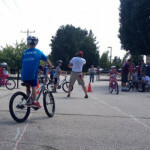 With all the bikes having a safety check, the Praxair team had a bike rodeo for bike safety training for the kids. The kids came off the bus while the Praxair team held up the posters with each child’s name on it. The kids rushed to the team to get their bikes. It was rewarding and wonderful according to Scott Fogg. That is really the magic of these events when a you get the privileged of seeing the eyes of a child when they get their first good bike! Each child was well rewarded with a bike and helmet and ice cream. Praxair, Inc. is a global, Fortune 300 company that supplies atmospheric, process and specialty gases, high-performance coatings, and related services and technologies to a wide variety of customers. With 26,000 employees and operations in more than 30 countries, Praxair is focused on helping our customers become more profitable, efficient and environmentally friendly. We serve a wide range of industries: aerospace, chemicals, electronics, energy, food and beverages, healthcare, manufacturing, metals, and more. At Praxair, we are challenging traditional ways while still doing what we do best – making our planet more productive – one customer at a time.